Rhodes Must Fall in Oxford is an offshoot of its namesake campaign in the University of Cape Town (UCT) South Africa. 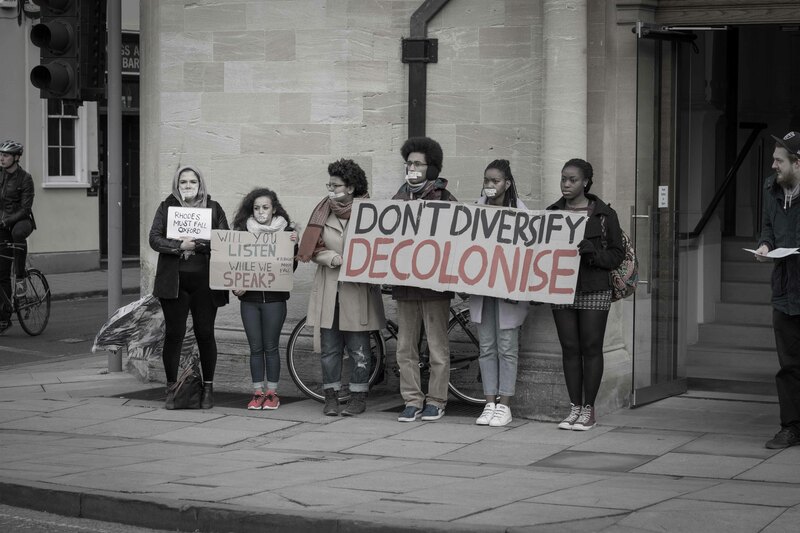 Led almost exclusively by people of colour, including a number of black South Africans, it seeks to challenge the white-dominated educational structures at the University of Oxford, redressing historic inequalities and the systematic marginalisation of non-white and non-British ethnic groups. 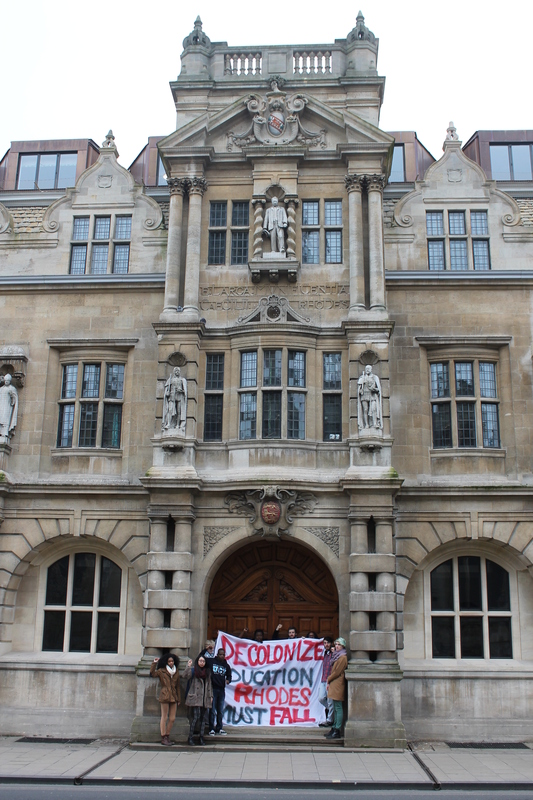 The symbolic galvaniser of their campaign is a call for the removal of a monument to Cecil Rhodes, which peers over Oxford High Street from Oriel College. A similar demand was successful at UCT, where the imposing statue of the British imperialist was removed in front of jubilant crowds earlier this year. On Dec. 17, Oriel College responded to a 2,300-strong petition calling for the statue’s removal. They agreed to remove the plaque honouring Rhodes, and initiated a six-month “listening exercise” to decide whether or not to remove the statue. The reaction of the mainstream media – almost uniformly (here, here, here and here) – has been one of incredulous outrage. Whilst it would be easy to pick apart the string of tired non-sequiturs, inaccuracies and absurdities that have been wheeled out over the past few days (guys, bringing down monuments doesn’t mean erasing history), it’s more interesting to consider what the reaction tells us about the mindset of our elite journalistic class. Let’s leave aside the point that the argument for removing the statue doesn’t just hinge on us holding different values to Cecil Rhodes (it’s about how it celebrates and sanctifies the continuing inequality, racism and global injustice that he did so much to contribute to). More interestingly, Jenkin’s point is absolutely right. Our history is littered with the maniacal misdeeds of murderous men, bound together by the congealed blood of millions of black and brown people. The intellectual elite, as their current reaction is proving, are well aware of this fact. They just don’t think it’s relevant. No – our historical leaders were tyrants; who cares? Take Churchill. In 1942, a massive harvest failure hit East Bengal in India. The ensuing famine became so bad that the British Viceroy of India begged for emergency relief. Churchill refused to send food supplies, rerouting goods back to Britain and reducing Indian Ocean shipping by 60% in 1943. As a result of these policies, 1-3 million Indian peasants died, far more than all Brits in the whole war. Churchill’s response? “The Indians must learn to look after themselves as we have done”. All this is documented by British historian (and former Editor-in-Chief of the Daily Telegraph) Max Hastings in his book, All Hell Let Loose.1 In the aftermath of Churchill’s famine, Hastings describes the lengths to which Indians went to survive: “many women resorted to prostitution, and some families sold their daughters to pimps.” Mothers killed their sons rather than see them fade from starvation. This was no mere isolated incident. The man who once declared he was “strongly in favour of using poisoned gas against uncivilised tribes,” due to how they would “spread a lively terror” – a threat he carried out – would later sign off on the overthrow of a democratically elected government in Iran in 1953.2 The royal Shah was reinstituted to rule over Persia with brutal effectiveness until he was overthrown in the 1979 Iranian Revolution. So that’s one our greatest national heroes: a murderous, racist chemical warfare advocate and arch imperialist. British history reads the same all the way down. From the trans-Atlantic slave trade, one of the most horrific crimes against humanity yet committed, to the 1877-8 famines in India – again, manufactured by the British – which killed up to 29 million Indians, to the mass internment and torture of Mau Mau’s in concentration camps in Kenya in the 50s,3 to the Iraq War (500,000 dead,4 a country flattened), the tale is one of a callous, self-interested nation led by degenerate and disgraceful human beings. Britain’s media apparatchiks know all this. Read the papers of the quality press carefully – The Times, Economist, Financial Times – and you’ll learn everything I listed above. Under the moral framework of the people who write for these papers, however, these facts are little more than an irrelevant side-note. Anyone who challenges the moral legitimacy of the people who perpetrated this history, and questions whether we should be “proud of our history in its totality,” (to quote another ‘Any Questions?’ panellist), will soon be accused of “utter imbecility”. And so those who have the greatest voice in this country all call for the statue to stay. But what this statue represents, and what the media reaction is reaffirming, is how little Britain has learned from its history. Like most other former imperial powers (and current ones, like the United States), Britain has failed to atone for its crimes, let alone rectify the continuing injustices and inequalities that stem from the world order we were so integral to creating. The Caribbean states, whose native inhabitants were exterminated, to be replaced by a totalitarian slave regime of imported Africans – since exploited and subjugated by white European powers for economic gain – are just beginning to assert themselves and their claims for justice. CARACOM, the regional body of Caribbean states, is attempting to sue Britain for reparations. Instead of hearing the legitimacy of this claim, Cameron tells Jamaica to “move on”. Rhodes Must Fall understand this. Their call for the removal of the statue is but one step in a process of decolonisation which started in the Global South seven decades ago, but still requires concerted effort in the Global North to complete today. Instead of a statue honouring the man who laid the foundations for apartheid, we should honour the erased legacy of those who suffered and died at the hands of men like Rhodes. We should honour those who fought to liberate their nations from the yoke of British and European imperialism, and the brave dissenters in the UK who stood against the dominant policies and attitudes of their time. Rhodes must fall. And the pathetic British intellectual and ruling class should fall with it. 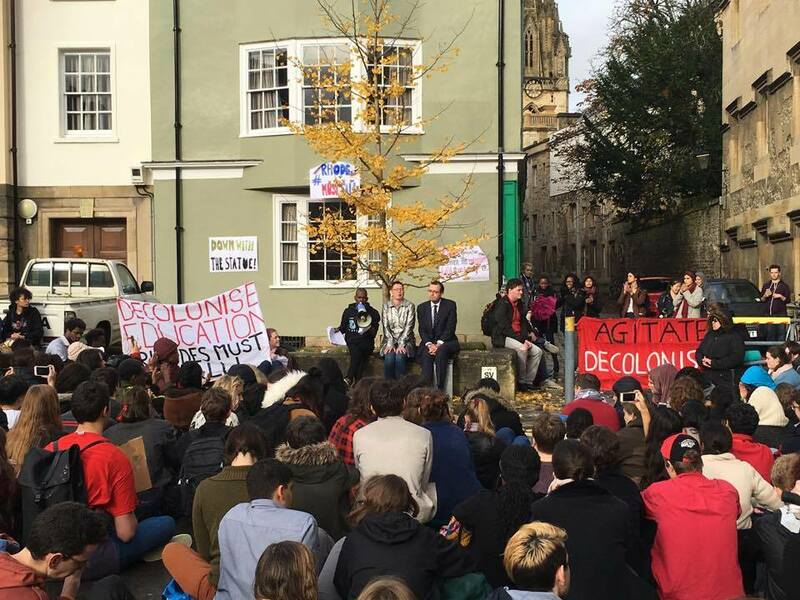 You can sign Rhodes Must Fall in Oxford’s petition to Oriel College here. To watch Connor expanding on the themes in this article in a video special, see here.